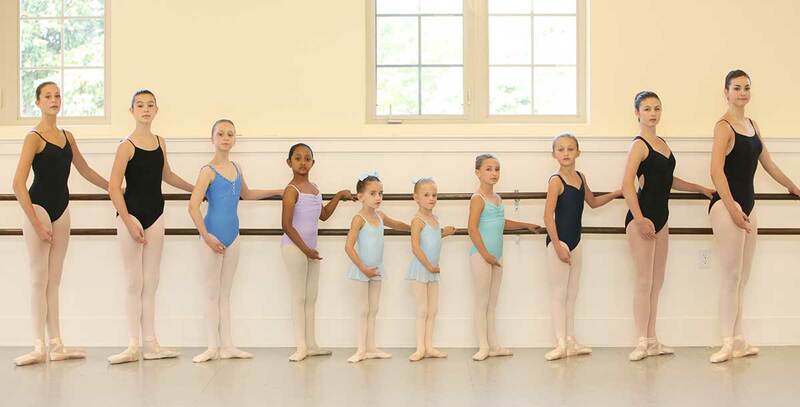 The New Albany Ballet Company’s dress code is designed to encourage discipline and unity among our classes. Students should be taught to respect ballet and all forms of dance from an early age and appearance is an important aspect to learning that respect. Students are required to follow dress code at all times. Pink leotard, pink tights, and pink ballet shoes need to be worn to all classes. Students may wear a pink tutu, skirt, leg warmers, or ballet sweater. Students need to have hair up in either a bun or secured neatly to the head. Bangs are permitted for class but will be required to be sprayed or pinned back for the spring recital. Little Ballet/Tap students will also need a small dance bag with their black tap shoes inside for tap class. Each child will be asked to put their ballet shoes in their dance bag between ballet and tap. White leotard, pink tights, and pink ballet shoes are to be worn for all classes. Students may wear a white tutu or skirt and either a pink or white pair of leg warmers or ballet sweater to class. Students need to wear their hair up in a bun with bangs sprayed or pinned back away from the face for class. Primary Jazz students will also need a small dance bag and a pair of black jazz shoes. Primary Jazz students may also wear black jazz shorts or pants to jazz class. Please do not wear undergarments under tights. Black leotard, pink tights, and pink ballet shoes need to be worn for all classes. A small black ballet skirt is optional. Students need to wear hair in a bun with bangs pinned or sprayed back. Students may wear a black ballet sweater and pink leg warmers. Please no undergarments under tights. Students should wear either their ballet class leotard or a black camisole leotard. Students will need to wear either black tights, black jazz shorts, or back capri pants over their leotard. No t-shirts, sweat pants, or camisole tops will be permitted. Students need to wear either a bun or hair secured to the head. Black jazz shoes are required. Students should wear either their ballet leotard or a black camisole leotard. Students will need to wear pink tights under their leotard and either black shorts or black Capri pants over top. Black tap shoes are required. Hair should be worn pulled up and away from the face. Students are not permitted to tap in the lobby. Please put tap shoes on right before class. Students in the Progressive Division modern classes need to wear the ballet class leotard and pink convertible tights. Hair must in a bun with bangs pinned or sprayed back. Black shorts or Capri pants are permitted for the Pre Pro modern class only. The beginning modern class may wear comfortable dance clothes and will not be required to follow the dress code above. Students need to wear comfortable dance clothes. T-shirts, shorts and sweats are all acceptable. Tennis shoes that are secured to the feet are required. Tennis shoes need to have shoelaces. Ballet 1A, 2A, 3A, and Int Ballet Classes Students need to wear the class uniform sold in the boutique to all classes. Pink footed tights and pink ballet shoes are required. Hair must be in a neat bun with bangs sprayed or pinned back. No undergarments should be worn under the tights. All leotard straps need to be sewn and should not be tied together in the back. Students may wear light pink ballet sweaters and light pink leg warmers to class. Ballet 4A, 5A, 6A, 7A, Int/Adv, and Ballet Tech Classes Students need to wear the class uniform sold in the boutique to all classes. Pink tights and pink ballet shoes are required as well as pointe shoes for those attending pointe classes. Hair must be worn in a bun with bangs sprayed or pinned back away from the face. All hair needs to be gelled so no wispies form during class. All leotard straps need to be sewn so the leotard fits tightly. Warm ups will only be permitted for the warm up portion of class.